Wind River Country sports some of the best fishing in 43,000 acres of lakes and reservoirs and nearly 2,000 miles of streams fed by mountain snow melt. Try a day trip fishing or go for the elusive golden trout on an epic backcountry trip. Conservation Stamp – $15 *all licenses except daily licenses, require the purchase of an annual Wyoming Conservation Stamp. Anyone traveling on or within the boundaries of the Wind River Indian Reservation needs to purchase a Wind River Tribal Fishing/Trespass Permit regardless of whether one is fishing or just hiking. Additional information required on fishing or trespassing on WRIR lands can be answered by the Tribal Game and Fish Department at 307-332-7207. Recreation Stamp *all licenses including daily licenses, require the purchase of an annual Recreation Stamp. No matter the time of year, if you want, you can fish in Wind River Country. Most recreation enthusiasts are lured to Wind River Country by the mountains and rivers that share the name. Fishermen and women are no exception. 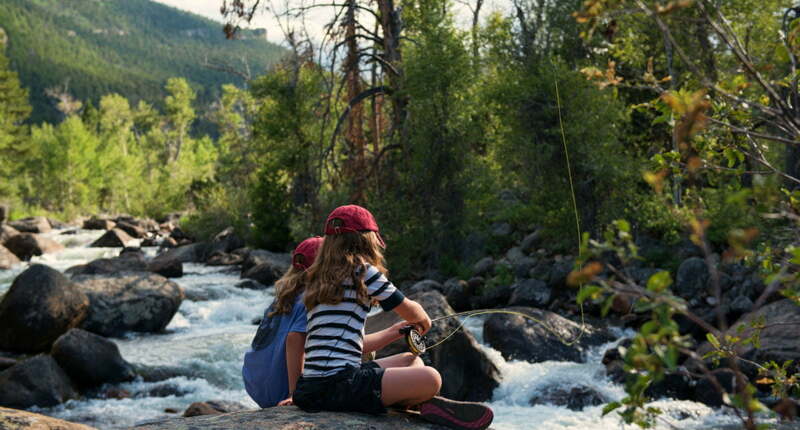 You could spend a lifetime chasing fish in all the corners of Wind River Country. The Wind River Mountains boast incredible rugged scenery, complete with high mountain lakes that are home to cutthroat and brook trout, along with a smattering of rainbow and brown trout and grayling, Kevin Johnson, the regional fisheries supervisor with the Wyoming Game and Fish told me. But it is usually the golden trout that people seek. Named for its coloring, golden with swaths of reds or pinks, the fish exist in few areas. 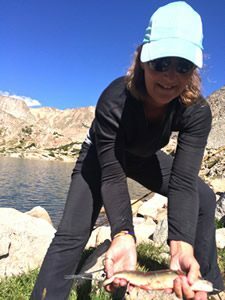 They thrive in the high elevation backcountry lakes of the Wind River Mountains, which is one of the premier places for fishing golden trout in the United States, Johnson said. Even those not specifically seek goldens are drawn to the alpine lakes of the Wind River Mountains. The scenery is stunning – walls of granite and trails that wind seemingly forever into the horizon. There’s the challenge of navigating difficult terrain for miles. And then, there is the reward of excellent fishing and, depending on where you go, a chance for solitude, peace and a fishing spot to yourself. But don’t worry if you aren’t feeling up to a wilderness adventure. There are plenty of other fishing opportunities that don’t take quite as much effort, but still yield rewards. There are public easements in the Dubois area, near the highway. 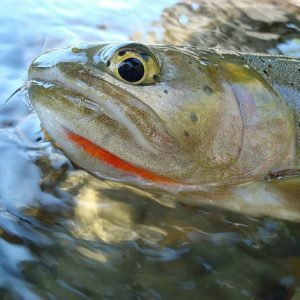 Dubois is also the only place in Wind River Country where you can find Wyoming’s native Yellowstone cutthroat trout. Near Lander there is public fishing on the North and Middle Forks of the Popo Agie River. Actually there is access across the area. 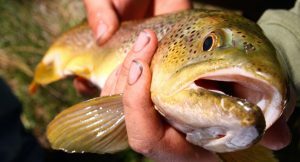 Wyoming Game and Fish Department’s Fishing Guide provides information on access on dozens of lakes, reservoirs, stream and rivers in the area. When the water is high and not conducive to fishing on the river, visit some of the lakes easily accessible from the Loop Road. The loop runs up the switchbacks at the end of Sinks Canyon outside of Lander to Highway 28 (or you can drive it in reverse). Fiddlers, Frye and Louis Lakes provide ample fishing opportunities, as well as campgrounds, a perfect combination of an outdoor experience without an arduous hike. Boysen Reservoir, where you can catch walleye, sauger, perch, crappie, ling, largemouth bass, bluegill, stonecat, black bullhead, mountain whitefish, lake, brook, cutthroat and brown trout and splake as well as several non-game species, is as you can imagine after that diverse list of fish, known for its fishing. Several state-record fish have been caught in the reservoir and you can buy bait, food and fishing licenses at the concessions and marina at the north end of the lake. The fishing doesn’t end on Boysen when it gets cold. In the winter I’ll see the shacks set up on Boysen Reservoir where the truly dedicated take advantage of the area’s first-rate ice fishing. The season starts when the water freezes, which usually begins in December and starts to thaw in March. And the cycle of year-round fishing continues. Fishing is perhaps what Boysen Reservoir is known for best. Several state-record fish have been caught in the reservoir. Diverse is perhaps the best way to describe the fishery. Anglers can catch walleye, sauger, perch, crappie, ling and other species, including largemouth bass, bluegill, stonecat, black bullhead and mountain whitefish. There are also non-game species like carp, flathead, lake and creek chubs and golden and sand shiners among others. It varies each year, but usually the water begins to freeze in December and doesn’t start to thaw until the end of March. Ocean Lake is also a popular ice fishing destination in Wind River Country. This lake, on a Wildlife Habitat Management Area, is home to lots of walleye, trout, bass, crappie, perch, bullhead, and ling. 210 Suite 5 Hwy 20 S.